Basic Medieval Sword-Fencing Terminology Abschneiden - "cutting aside" also known as Schnitt ("slices") and Rakes in English. 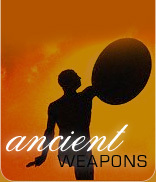 They are used at closer distance against the opponents forearms and hands. Absetzen - "setting aside", word was used to signify a type of t move where the sword is hooked over the opponent's and forced downwards to trap. It mau simply mean parry with a thrust. Am Schwert - "on the sword", attacks made while maintaining constant pressure on the opposing blade, also known as the Winden that means winding or turning. Back guard/ stance - weapon pointing down and diagonally backward, also called Mittelhut by Medieval German masters, and a Tail guard by the Italians. Binden - "a bind" or trapping action by pressing blade upon blade or edge on edge. Cuts - The German schools recognized three major forms of cut: Oberhau (over cuts) - downward diagonal or vertical, Unterhau (under cuts) upward or rising, and Zwerchhau or Mittelhau (cross cuts) horizontal right-to-left and horizontal left-to-right. Further there were specific names for the cuts for forearms, neck, leg etc. Close guard/stance - Called Boar's Tooth guard in the Italian styles, it is a position similar with the knees lowered and the weapon pulled in low closer to the hip to deflect the attacks. Durchwechseln - "changing through" the move of evading contact with the opponent's blade while striking or simply changing the line of attack. Durchführen - "disengage under" in close-combat leading your point under their sword to thrust at the opening on the other side. En Garde - ("on guard") French term first used in 1400's to refer to simply a ready posture of both attack and defense with any sword or weapon. English great-sword fighting - Double Rowndes (a "molinello"), Rakes (draw cuts), Haukse and Halfe Haukes (strikes from the high guard) are the terms form English fencing texts. Fuehlen - Gauging the opponent's mind. The Four Openings - four areas to aim on - 1. Opponents right side, 2. Left side, above the belt, 3. Right below the belt, 4. Left below the belt. Foyne - 14th century term for thrusting. Gaukler - meaning "juggler" or "acrobat", for those teaching impressive but ineffective fencing. Gioco stretto - "Close Playing", Italian for entering techniques, in the later English systems of cut-and-thrust sword these were known as "gryps". The actions involved grabbing the opponents arm, striking with a pommel etc. The german close-in techniques involve grappling and disarming techniques. Guards/Wards/Stances - Huten or fighting positions and postures. There are 14effective fighting postures. The five major ones are High, Middle, Low, Hanging, and Back positions. Halb Schwert - "half-sword" techniques of gripping the middle of the blade with the second hand, gloved, armored or bare. This allows a range of striking and deflecting actions. They are called Mezza Spada ("middle sword") or even "false-point" blows in Italian. Handarbeit - handwork, it is that phase of the combat where the distance between the opponents has closed in. Hanging guard/stance - "Hengen" (left or right) are important long-sword postures, they are called the Ochs ("ox") stance in the German. Hart und Weich - hard and soft, the idea is that when the blades contact, gauge the opponents mind and oppose strength with weakness and weakness with strength to control and exploit. Inside guard/stance - used for warding, thrusting and parrying, it is called Finestra ("Window guard") in Italian, Hangentorte ("hanging point") in German. It is a position where blade pointing horizontally forward and the hilt is pulled in close. Kron - "crown", German for the Middle guard, called Corona in Italian. It was also a type of half-sword parry against a vertical downwards. Kunst des Fechtens - the German art of fighting with long-sword, messer or wrestling. The unarmored combat was called Blossfechten, combat in plate armor was called Harnischfechten (or "harness fighting"). Kurze Schneide - back of the single edged sword. Lange Schneide - the sharpened edge of the sword or the front of the sword. Leger - German for position or stance, with reference to the fighting posture. Leichmeister - "dance-master" a derogatory term used instructors teachin flashy but ineffective fencing techniques. Long guard/stance - defensive thrusting position with the blade horizontal and arms extended straight forward, ideal for warding and making stabbing attacks or stop-thrusts Low guard/stance - called Alber, the "Fool's guard" In the Germans since it was thought foolish to rely only on defense, comanly known as the boar's tooth guard. Meisterhau - "master cuts", prized techniques in which the swordsman strikes in a manner so that his sword deflects the incoming blow while simultaneously hitting the opponent. Mittelhau - a horizontal left-to-right cross-cut. Nach - It is a technique of defensive countering, opposite of Vor.. Nach und Vor are two important concepts in the Fechtschulen. Nachreissen - "traveling after", it is a method of overcoming the attack by attacking immediately after the adversary's own attack. Pressing-the-hands - a move where the blade is pushed against the opponent's forearms or hands just as they lift or lower to strike. Rota - It is a countering technique where the back edge is raised to deflect the opponents blade and use a descending cut immediately with the forward edge. Rownde /Double Rownde - It refers to change in line of attack by first bringing the weapon down, back and then high for rownde and twice for double rownde. Schielhau - a sideways cut with the back or short edge of the blade, delivered with only one eye on your opponent . Scheitelhau -a vertical cut, delivered either above or below the waist. Schwertnemen - "Sword taking" close-in disarming or trapping actions, called Gioco Stretto (Close Playing) in Italian, they are used in long sword fighting. Short guard/stance - it is a close range posture with low hilt and vertical bladeand knees bent. The "Spring" - (Das gayszlen) it is increasing the rang eof the blade by cluching the pommel with the other hand. Stark - It is the stronger part of the long sword. It extends from the middle to the hilt. Stuck und Bruch - ("technique and counter"), it is the basic proposition that every technique or stance has a counter and every counter has a technique. Throwing-the-point - Converting a false cutting blow into a sudden straight thrust. Ueberlauffen - (overrunning), another counter attack, implemented just when the opponent is attackingand striking their closer targets exposed by their attacking stance. Untere Ansetzen - techniques delivered under or below the opponent's guard. Vor - the offensive principle of fighting, aggressively taking the initiative. Waage - ("balance") standard fighting position with legs and arms slightly bent. "Was sehrt, das lehrt" - ("What hurts, teaches") the basic concept that the real knowledge is gained by the realistic instructions. Winden - the "Winding", close binding actions to maintain pressure and dominate the opposing blade. Zornhau - a diagonal cut, delivered either above or below the waist. Zornhut - ("guard of wrath" or "rage guard") it is a rather vulneraple stance where the sword is point down behind the back but allows very powerful blows when effectively used.